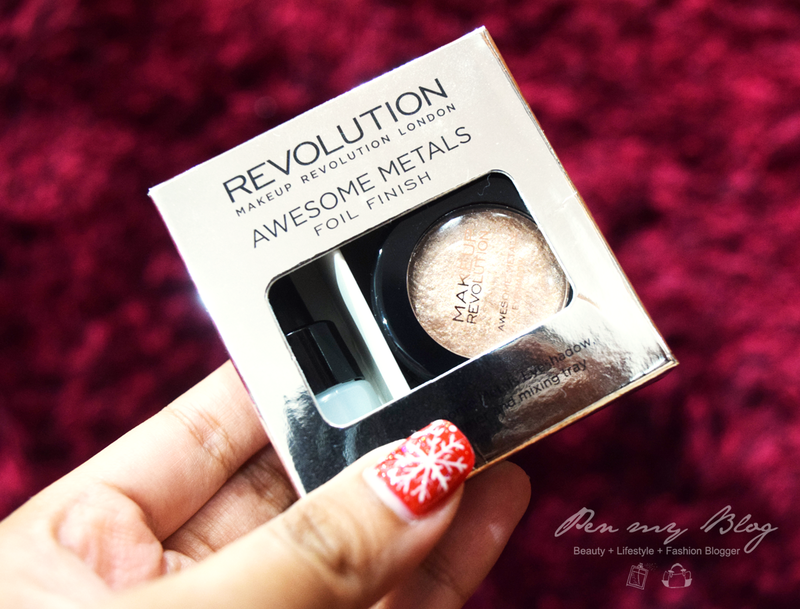 Going back to when I did a previous review on Makeup Revolution London's "Give Them Nightmares" Eyeshadow Palette along with their Amazing Lipsticks range, I figured that it was time to give a lowdown on their Awesome Metals Foil Finish in Rose Gold. Being attracted to it due of it's shade as not many foil finishes come in rose gold, more or less you would often get something of a rather solid tone; a pure silver or gold of sorts but more often than not, it would be never something in between. However retailing at RM39.00 it would not be a bad purchase but then again the question remains, is it worth it? Now as much as I adore pigments, this has to be the second time ever that I have tried eye foils; what with Stila being my first and to be completely honest, I have developed a rather love hate relationship for them. Application is often found rather tedious with the dropper and tray plus don't even get me started on it's uneven distribution and glitter build up. 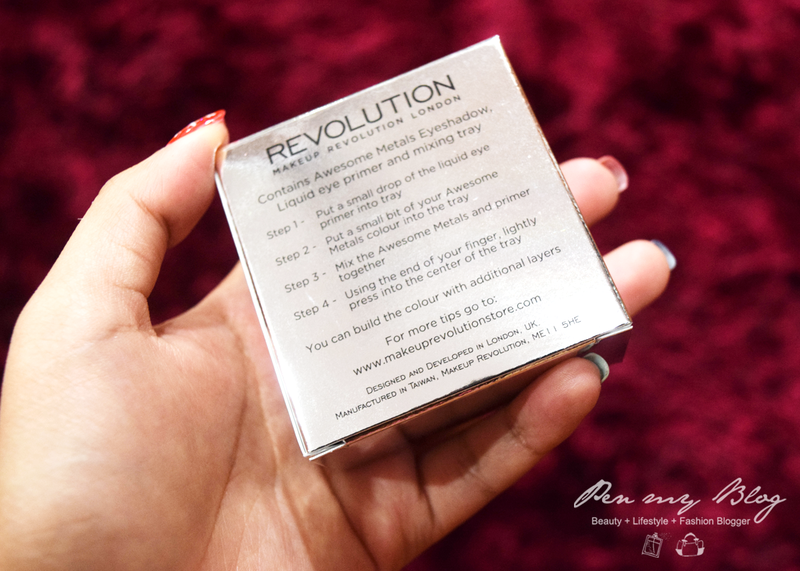 However with Makeup Revolution London doing so well in it's eyeshadow formulation and quality of pigments, I found myself being rather hopeful that their Awesome Metals Foil Finish would do the trick and cease my worries. 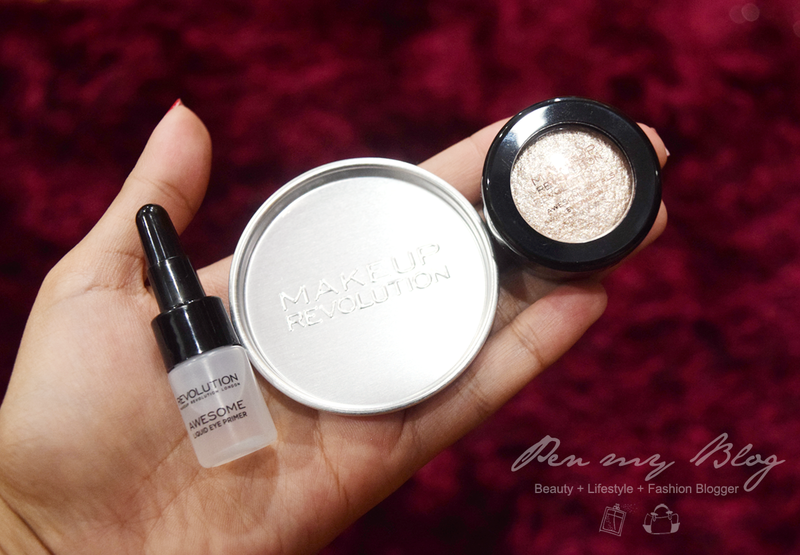 So with the unboxing, Makeup Revolution London Awesome Metals Foil Finish in Rose Gold comes with a liquid primer, a mixing tray and the intense cream-like pigment. Technically it's the same three step journey that all foil finishes have to creating the desired look of the day. Upon swatching; pigmentation and color is immensely beautiful. However like all great products out there, there is unfortunately a downside to this. Now the swatch you see above is applied with the liquid eye primer; which gives out an extremely easy blendable ability to the product but unfortunately, that comes the uneven spill of glitter if not applied properly. 1) Put 2-3 drops of the liquid eye primer into the mixing tray. 2) Take your index finger and press into the Awesome Metals Foil Finish. 3) After taking some of the product out; mix the Awesome Metals Foil Finish with the liquid eye primer with the same index finger. 4) Apply it to your lids in one direction and build up. Upon evening it out onto the lid, one thing to note is that the usage of brushes will not work here because it would be quite a mess to clean up. Plus with all that glitter left behind, it is best to simply warm it up in your hand and work it in one direction to your lid. Now usually only two drops of the liquid eye primer is needed, but in this case; I found it best to work with three for easier application. Nonetheless the result is most definitely vibrant and extremely glossy but again the unevenness with regards to the application is still there. It's probably not as flaky as I expected it to be after it dries out; which is most probably due to the amount of liquid eye primer used but there is always some room for improvement when it comes to the formulation for foil finishes like these. So the sum it up, while the color is extremely beautiful, I don't think this would be something that I would use on a daily basis as the the combination of both shimmer and glitter takes this Awesome Metal Foil Finish to a whole new level; even after removal. However, this color does do a wonderful smokey eye look and I have to give props toMakeup Revolution London for making each of their five colors so pigmented. Currently available in Diamond, Copper, Platinum, Goddess and Rose Gold for RM39, you can always head on over to their Official Website of Facebook Page to find out more. After all, if you don't mind the glitter, this product would always make an awesome addition to creating wonderful eye looks for any girl out there.